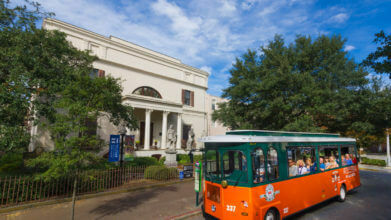 Referred to as “The Hostess City of the South,” Savannah is the oldest city in Georgia and has a long and colorful history that attracts millions of visitors each year. From cobblestone streets and public parks to some of the most unique Antebellum architecture of the South, Savannah is an old beauty that has aged with grace. Established in 1733 when General James Oglethorpe and 120 fellow passengers on the ship Anne landed on a bluff along the Savannah River, Oglethorpe named the 13th and final American colony Georgia after England’s King George II. Savannah became the first city of this new land. Upon Oglethorpe’s foresight, the city of Savannah was laid out in a series of grids allowing for wide streets and public squares. Considered America’s first planned city, Savannah had 24 original squares with 22 still in existence today. A few decades after the founding of Savannah, it proved a strategic port city in the American Revolution and during the American Civil War. In 1778, the British took Savannah and held it until 1782. Eventually, a land-sea force of French and American troops reclaimed the city’s independence. After this turbulent time, Savannah saw a long period of agricultural flourish. With rich soil and a favorable climate, Savannah and its surrounding land became home to cotton and rice fields as plantations and slavery became highly profitable systems. And the invention of the cotton gin on a nearby plantation meant that the city rivaled Charleston as a commercial port. In 1796 and 1820, Savannah suffered from two devastating fires that each left half of the city in ashes. The year 1820 also saw an outbreak of yellow fever that killed nearly a tenth of the population. But, like any strong Southern city, Savannah survived and rebuilt itself. During the Civil War, Savannah suffered from sea blockades so fierce that its economy crumbled. Saved from the fires set by Union soldiers throughout the Southeast, the city was offered by Union General William Sherman as a Christmas present to President Abraham Lincoln. It’s been said that Savannah was spared from fire because General Sherman was so impressed by its beauty that he couldn’t destroy it. Georgia is pivotal in the early stages of prohibition as it’s founding father, General James Oglethorpe was among the first to push for a ban on alcohol. Oglethorpe started a petition to King George II for a decree banning the creation and sale/distribution of alcoholic beverages. Today, Savannah is home to the country’s only prohibition museum, chosen because of it’s integral role in this era of U.S. history. Fast-forward to America’s mid-century era of the 1900s when Savannah experienced a renaissance of sorts. In the 1950s, a group of women banded together to preserve historic structures set for demolition. This lead to the formation of the Historic Savannah Foundation and Savannah’s Historic District was designated a National Historic Landmark in 1966. Buildings such as The Pirates’ House (1754), Independent Presbyterian Church (1890) and the Cathedral of St. John the Baptist (1876) all stand today and have been restored to their original grandeur. Today, Savannah is Georgia’s fifth-largest city and third-largest metropolitan area. It is an industrial center, important Atlantic seaport and one of the busiest tourism destinations of the Southeast. Through wars, fires, widespread disease and the threat of demolition, Savannah has remained a cultural and historical hub of the South.